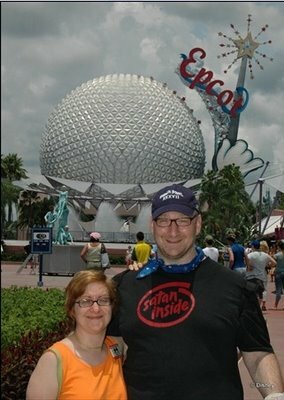 So one of the days at Epcot it was a little rainy, and we said, Hey we are here-- let's prove it. Let's get some pictures taken with characters! We were right by the Character Connection (which is an indoor place where you can get photos with the characters) we walked in, and there was ABSOLUTELY no line. Mickey, Goofy, Donald, Minnie, the Chipmunks. On the other side were Pluto, Snow White, and Mary Poppins. Although we both felt a little bit weird (two adults both way past 30 getting our pictures taken with some furry characters.... After the initial little bit of awkwardness it was loads of fun. One of the things that's pretty interesting is Disney's real ability to control the situation. They've been thinking about the environment of their park for some time. For example, it was Stephanie's Birthday, so she got to wear the Birthday pin. (A different one is available for each park) Just about every cast member in the Park wished her a Happy Birthday, and made an extra effort to talk to her. Many people said "What are you, 21?" (Clearly coached) They even set it up so that Goofy sang her Happy Birthday. Garsh Mickey! The girl at the Cool Coke stand called up the special Goofy Birthday phone code, and minutes later-- Goofy Sings! Disney is also pretty savvy on the commercial end-- they take free photos and give you a photopass so that you can claim them by Internet (and pay High prices) They disabled the ability to grab the photos, but I wasn't going to let a little thing like that stop me. A little computer creativity and voila-- low-res image gallery for everyone to enjoy. Of course, these are low-res-- if you want a print out, I'd have to pay $12.95 per. Yikes! Click the image to view a slideshow of our photos with Disney characters. Comments on "Pictures of Disney Characters (with a little bit of Satan Inside)"